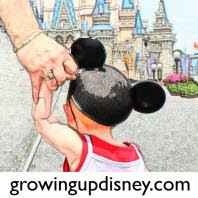 Growing Up Disney: A Walk Around The World With Ridge--Trip Report part II--- finally. A Walk Around The World With Ridge--Trip Report part II--- finally. Well hello there, it has been a long break in between these two parts of my telling of my May trip to Disney but the Editor thought it a nice idea if we all took a little break to recharge our batteries, usher new additions of the family into the world and enjoy a little break in general. When last I left off I was going to talk about Star Tours and how fantastic it was. See here for an article I wrote for the Magical Blogorail on this topic. It was fantastic and I can’t wait till my October trip to ride it again. So much so that on several occasions I have thought about just getting in the car and making a mad dash for the weekend and seeing some of my wonderful Disney friends. If there is a couch to sleep on I’ll be on my way right now! If not I’ll be waiting a little while longer. To the rest of my trip: Return of the Merchandise Tent, Jabba’s Hut. A day or two after the main ceremonies to get everything kicked off I found myself once again in the tent and waiting in line to help a friend pick up a DVC limited edition pin. While there I lost my mind for a second and bought myself a writing pen, limited edition to 1000 and didn’t question the price till I was at the register and it was 50 bucks… I wish I had upgraded my annual pass to premium before that day. But I bought it anyway and we moved on. I moved back and forth between groups of Disney friends. At this point I do have to say that I am far enough removed from the trip that some of it has run together. Good thing I have pictures. Check out my flicker account for all of the pictures from my trips! In the couple days that followed I was on the go like nobody’s business, I spent time in all of the parks with tons of people but the main group for the bulk of my trip was Christa, Ashley and Jeb. Jeb is a Disney newbie so there was lots of explaining from us nerds about everything. I am pretty sure a good time was had by all. We all seem to be pretty alike so it was easy to hang out. However, Jeb and the Country Bears… priceless moments in time. I did break away for a few minutes at Magic Kingdom so not to completely bore my friends and took pictures with my 35mm film camera. Photography has become quite the hobby of mine and I never want to call myself a photographer; I just want to be an avid hobbyist. The Hall of Presidents is perhaps my favorite area to shoot because I love the architecture and have already posted about it before so I won’t go into that here. I drove everywhere on my last trip and stayed off property again on the second half of my adventure to save a little money. Now I have brought up the fact many a time that I use an iPhone and one of the best things I do with it is drop a pin on my map when I get out of my car in the lot and I will be taken right back to it at the end of the day. I tell this little factoid, I forgot to do this at the Studios, being so excited to get inside and see my friends. So at the end of the day when I was ready to leave I walked all the way to the back of the parking lot, forgetting that I was there at rope drop and had parked one row over from cast member parking. Good job me. Things that were highlights: Having a churro and sitting in a rocking chair watching the crowd walk by in Frontierland. I’ll never forget standing in line for 30 minutes for Pirates, wow lots of laughing. Giving a guided tour of Liberty Square, look for the musket in the window next time and the symbol of a tax payer over a back gate. Seeing the new queue at Haunted Mansion, it really is very nice and I am so glad the old turnstile is gone. Having a Dole Whip…. Just hanging out with great people at a fantastic place. I’ll be returning to WDW soon for the 40th anniversary on 10/01/2011. It should be a blast getting to see old friends again and maybe one day I can become one of the faithful and get moved down there. Till next time friends, see ya real soon! oh good memories..... "if you look in the window, you'll see the colonial table cleaner. that signified the house was germ free!" thanks for the smile this friday morning!